We’re here to introduce you to a new ‘superfood.’ It’s called baobab, the fruit from a huge, gnarly, iconic tree that grows throughout Africa. With more antioxidants than açaí and goji berries, baobab is a fruit your skin will love. Chances are you won’t find baobab in your local grocery store. Our favorite way to enjoy it? In Bumbleroot drink packets. Bumbleroot combines the hydrating power of coconut with the nutritiousness of baobab, plus other fruits and herbs (depending on the flavor). And it’s all in a convenient drink packet that you simply add to your cup of water. Why are We Speading the Word About Bumbleroot? We love what Bumbleroot is doing. By featuring baobab in their drinks and creating a local supply chain to harvest and process it, Bumbleroot is providing jobs to the people of Zimbabwe and helping to build their economy. Bumbleroot sources their ingredients responsibly, pays their workers fairly, and opts for sustainable packaging options. Take a stroll down the bottled beverage section at the grocery store and you’ll find hundreds of ways to hydrate. One problem: the bottles. Sure, you can recycle them, but creating as well as recycling these bottles takes energy and resources. That’s why we love the minimalist packaging of Bumbleroot. Each small drink packet contains coconut water and baobab (plus other fruits, depending on the flavor), which mixes with your glass of water to create a delicious and healthy drink. Another problem with a lot of beverages: the sugar. There are a lot of reasons to avoid sugar. For one, it promotes premature aging. Sugar-sweetened beverages are especially bad, as the sugar without fiber leads to a bigger spike in your blood sugar, which can contribute to weight gain. We love that Bumbleroot relies on the natural sweetness of coconut and fruit, with no added sugar. The baobab tree is the whole reason Bumbleroot began. Sara (the founder) learned about this amazing fruit while she was living in Zimbabwe. She saw willing farmers without access to market and saw how she could make that connection. By creating Bumbleroot Sara is simultaneously introducing a super nutritious food to the market, but also helping people of Zimbabwe make a living. Prebiotic. The fiber in baobab has prebiotic properties, meaning it helps good bacteria grow in your gut. Nutritious. A serving of baobab provides 25% of the vitamin C you need. Plus, it’s high in potassium, magnesium, and calcium. Alkaline. One of the highest alkaline foods available, baobab has a PRAL rating of -52. You can enjoy all of these benefits when you drink Bumbleroot. Coconut water is the base ingredient in Bumbleroot, making this drink super hydrating. If there’s one thing we tell people who want beautiful skin, it’s to stay hydrated. Oh, and wear sunscreen. But also—stay hydrated! Of course, drinking lots of water is the best way to do this. But coconut water also provides electrolytes, which are important for fluid balance. 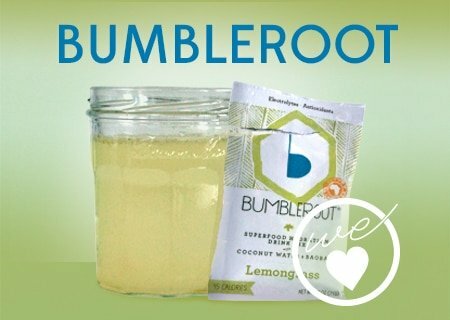 Given that not everyone likes the taste of coconut water, Bumbleroot is a great alternative way to enjoy its hydrating benefits. Baobab adds a light, citrusy taste. And it's sweetened with monk fruit which has a glycemic index of 0. So you get a boost of nutrition without a spike in your blood sugar. Each flavor contains additional fruit or herbs, adding more nutrition to each sip: Blueberry, Lemongrass, and Pineapple Mint. The high antioxidant content of baobab really does your skin a favor, too. Antioxidants help protect from environmental stressors we encounter from day to day. After working out: You got sweaty, now it’s time to put electrolytes back into your body. You can bring Bumbleroot to yoga, the gym, or on your next bike ride. Before or after drinking coffee: Coffee is a diuretic, which means it makes you pee. If you’ve ever felt dehydrated after drinking coffee, try giving yourself some extra hydration before or after your next brew. You’ll feel a lot better. After a night out: When you’ve enjoyed a bit too much wine, Bumbleroot can help make the morning after a little easier to bare. In smoothies: This is a great way to add even more nutrition to your green smoothie. Airplanes, or other places you’re not allowed to have liquids: Bumbleroot isn’t a liquid until you want it to be. Those midafternoon munchies: You’ve got a couple hours until dinner, but snack time is calling. Bumbleroot is delicious enough to be satisfying, and low enough in sugar (9 grams) that you won’t feel bad about drinking it. Plus, staying hydrated helps you ward off cravings. We wouldn't be telling you about this if we didn't absolutely love it, so know that Bumbleroot has our absolute stamp of approval. We hope you'll try some! To get your free packet of Bumbleroot simply place an order on our site (everything except sample kits and gift certificates) and a free sample will be sent with your order! Every month we choose something we love. Sometimes (like this month) we'll send you some for free. Other months you'll get a coupon. Sometimes there's no special deal, just info from us on why the company and their product is so special. If you subscribe you'll get one email each month letting you know who's being featured. We focus on ethical, sustainable, wellness-oriented companies. Hi Becky! You just mix the drink packet with a glass of water. 🙂 It has coconut water in it.